What is a market sector? The market sector is a part of the economy, usually broader than an industry. Two industries may form part of one market sector. For example, the pharmaceutical and medical devices industries are part of the health care sector. The world’s major stock markets, and most of the smaller ones, are divided into market sectors so that company stocks that compete directly with one another are listed together. Market sector in the bond markets refers to the type of issuer, i.e. corporate, utility, government or state. In marketing, the term has the same meaning as market segments, i.e. parts of the mass market that can be specifically targeted in advertising campaigns. MSCI and Standard & Poor’s developed an industry taxonomy in 1999, called GICS (Global Industry Classification Standard). GICS is widely used today by the global financial community. 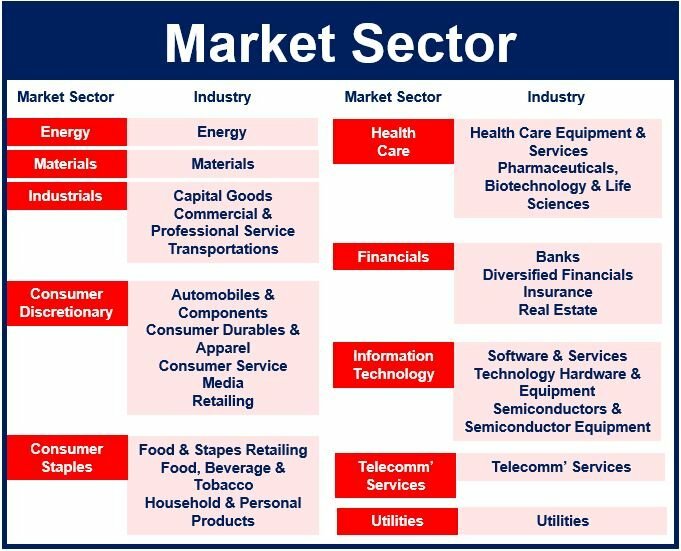 It breaks down market sectors as follows: Energy, Materials, Industrials, Consumer Discretionary, Consumer Staples, Health Care, Financials, Information Technology, Telecommunication Services, and Utilities. Analysts commonly specialize in certain market sectors. For example, an analyst at a large research firm may cover only medical device, pharmaceutical and biotech firms, i.e. the health care sector. Primary Sector: agriculture, mining and forestry. The extraction of raw materials and harvesting of natural products from the earth. Secondary Sector: manufacturing, construction and processing. Tertiary Sector: comprises services, including retail sales, financial services and entertainment. Quaternary Sector: part of the economy that is based on knowledge applicable to some business activity that typically involves the provision of services. This may include data collection, distribution and technology, research and development, vocational education, and business consulting. This video talks about how market sectors performed in 2014. The best performer was health care, while the worst was energy.